MUCH as we in India might like to think we were the central focus of Britain’s national life in the 19th and 20th Centuries, we were not. India’s matters were handled mostly by a senior cabinet minister to whom the governor-general or viceroy reported. Though possession and control of India gave the British a sense of mission, self-importance and grandeur, and events in India (mostly bad ones) could hog the newspapers for a few days, it was never the case that India dominated Britain’s political consciousness or national agenda for any length of time. British prime ministers and diplomatists, from Pitt through Canning, Palmerston, Peel, Gladstone, Granville, Disraeli and Salisbury, mostly had other concerns of foreign policy, mostly in Europe and also in the Americas, Africa, and the Near and Far East. India was peripheral to their vision except as a place to be held against any encroachment. A French historian used to begin lectures on British history saying “Messieurs, l’Angleterre est une ile.” (“Gentlemen, Britain is an island.”) The period of unambiguous British dominance of world diplomacy began with Pitt’s response to the French Revolution, and unambiguously ended in 1917 when Britain and France could have lost the war to Germany if America had not intervened. Since then, America has taken over Britain’s role in world diplomacy, though Lloyd George and Churchill, to a smaller extent Harold Wilson, and finally Thatcher, were respected British voices in world circles. Thatcher’s successor Major failed by seeming immature, while his successor Blair has failed by being immature to the point of being branded America’s “poodle”, making Britain’s loss of prestige complete. Between Pitt and Flanders though, Britain’s dominance of world affairs and the process of defining the parameters of international conduct was clear. It was an era in which nations fought using ships, cannon, cavalry and infantry. The machine-gun, airpower and automobile had been hardly invented. Yet it is amazing how many technological inventions and innovations occurred during that era, many in Britain and the new America, vastly improving the welfare of masses of people: the steam-engine, the cotton gin, railways, electricity, telecommunications, systems of public hygiene etc. The age of American dominance has been one of petroleum, airpower, guided missiles and nuclear energy, as well as of penicillin and modern medicine. It was during the period 1791-1991, between the French Revolution and the collapse of the Union of Soviet Socialist Republics, that world diplomacy created the system of “Western” nation-states, from Canning’s recognition of Mexico, Brazil, Argentina, Colombia etc to the emergence of the European Union. There is today peace in Europe and it has become unthinkable there will be war between e.g. France and Germany except on a soccer pitch. Even the unstable Balkans have stabilised. The transition from British to American dominance occurred during and because of the 1914-1918 World War, yet that war’s causes had nothing to do with America and hence America’s rise has been somewhat fortuitous. The War superficially had to do with those unstable Balkans in the summer of 1914 and the system of alliances developed over the previous 100 years; beneath was the economic rise of the new Germany. Austro-Hungary went to war against Serbia, causing Germany its ally into war with Russia, Serbia’s ally. Belgium’s neutrality was guaranteed through British diplomacy by the Treaty of London in 1839 signed by Austria, France, Britain, Russia and Prussia. This “scrap of paper” Germany tore up to invade Belgium on 4 August 1914, because it was easier to attack France through Belgium than directly as most French generals had expected. Though Germany had no dispute with France, France was Russia’s ally, and the Germans had long-feared fighting on two fronts against larger but more slowly mobilising forces. Violation of Belgian neutrality caused Britain into war with Germany. So all Europe was at war from which it would fail to extricate itself without American intervention. This arrived in 1917 though it too had been provoked by German submarines sinking American ships in the Atlantic. The actual impact of American forces entering the battlefields was small, and it was after the Armistice, when the issue arose of reparations by Germany to everyone and repayments by Britain and France to America, that America’s role became dominant. New York took over from London as the world’s financial capital. Woodrow Wilson longed to impose a system of transparent international relations on the Europeans who had been used to secret deals and intrigues. He failed, especially when America’s Senate vetoed America’s own entry into the League of Nations. America became isolationist, wishing to have nothing more to do with European wars ~ and remains to this day indifferent towards the League’s successor. But the War also saw Lenin’s Bolsheviks grab power after Russia extricated itself from fighting Germany by the peace of Brest-Litovsk. And the Armistice saw the French desire to humiliate and destroy German power for ever, which in turn sowed the seeds for Hitler’s rise. And the War also had led to the British making the Balfour Declaration that a Jewish “National Home” would arise in Palestine in amity and cooperation with the Arabs. The evolution of these three events dominated the remainder of the 20th Century ~along with the rise and defeat of an imperialist Japan, the rise of communist China, and later, the defeat of both France and America in Vietnam. Hitler invaded Poland on 1 September 1939, and Britain and France declared war on Germany on 3 September. The next day in faraway India, the British in a panic started to place Jinnah on an equal footing as Gandhi ~ astounding Jinnah himself as much as anyone since his few supporters had lost the 1937 elections badly, especially in the provinces that today constitute the country he wished for. After the defeat and occupation of Germany and Japan, America’s economic supremacy was unquestionable. Utterly exhausted from war, the British had no choice but to leave India’s angry peoples to their own fates, and retreated to their fortified island again ~ though as brown and black immigration increased with the end of Empire, many pale-skinned natives boarded ships for Canada, Australia and New Zealand. America came to have much respect for its junior British ally during the fight against Hitler and later in the political battle against the USSR. It was Thatcher who (after battling Argentina in the South Atlantic) led Reagan to make peace with Gorbachov. With the end of Soviet communism, Germany would be unified again. All across Christendom there was peace for the first time ever, and a militarily powerful nuclear-armed Israel had been created too in the old Palestine. In this new period of world history, the Security Council’s permanent members are the modern version of the “Great Powers” of the 19th Century. The American-led and British-supported destruction of Baathist Iraq, and threatened destruction of Khomeinist Iran mark the final end of the League of Nations’ ethos which had arisen from the condemnation of aggression. In Osama bin Laden’s quaint idiom, there seems a battle of “Crusaders” and “Zionists” against Muslim believers. Certainly Muslim believers (which means most Muslims as there are relatively few agnostics and atheists among them) think that it is obvious that the Universe was created, and that its Creator finally and definitively spoke through one human being in 7th Century Arabia. Many people from North Africa to the Philippines are not often able to conceive how things might have been otherwise. The new era of history will undoubtedly see all kinds of conversations take place about this rather subtle question. 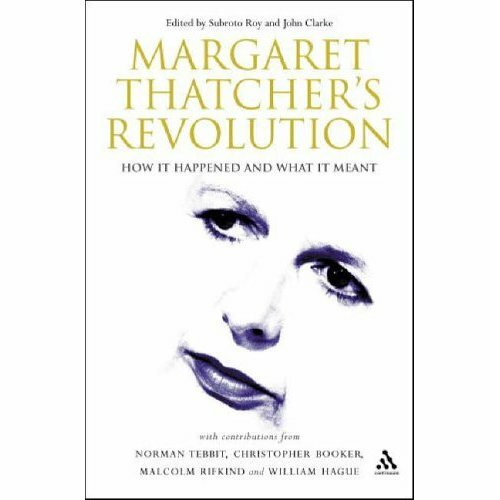 Margaret Thatcher’s Revolution: How it Happened and What it Meant, edited by Subroto Roy & John Clarke, London & New York: Continuum, 2005, 2006.